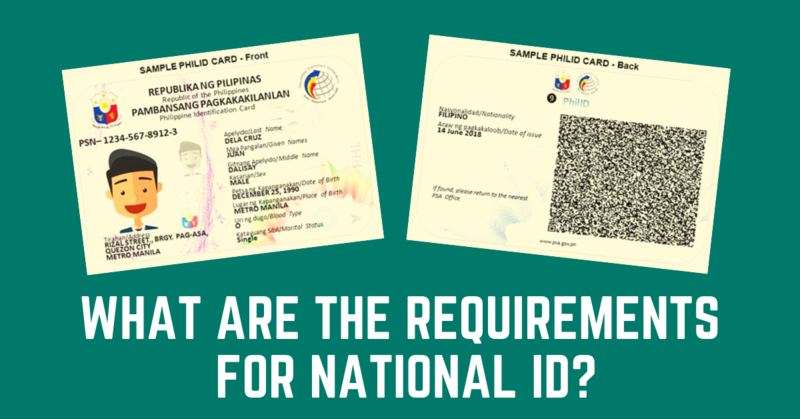 Many are asking what are requirements needed for National ID. If you want to apply for the National ID or Phil ID, you need to prepare the following documentary requirements. The applicant shall submit a duly accomplished application form to any designated registration center. As of this writing, the PSA has not yet publicly released the sample application form. Other equivalent identification documents as may be determined in the guidelines issued by the PSA. For resident aliens, his or her Alien Certificate of Registration (ACR) or ACR ID shall be presented. In case a married woman presents an identification document which reflects her maiden name, she shall be required to present her PSA-issued marriage certificate should she opt to adopt the surname of her husband. In the event that the applicant is unable to provide the documents under immediately preceding item, any of the following documents shall be presented. Identification documents issued by the private sector which comply with the requirements set by the PSA. Notwithstanding the foregoing, appropriate guidelines and mechanisms shall be issued to ensure that the registration is not prohibitive and restrictive as to unduly defeat the purpose of the Act. An applicant who does not possess any of the documents in above items 2 and 3 shall be endorsed by a qualified introducer in accordance with the guidelines set by the PSA, taking into consideration the specific circumstances. As a minimum requirement, a qualified Introducer shall be of legal age and a PSN holder. The PSA shall maintain a record of all qualified Introducers, each of whom shall be linked to all the registered persons that they have endorsed. Persons who have been registered through a qualified Introducer shall be tagged as such in the PhilSys. I have with me Professional Driver’s license, is it ok for me to process? Make sure to bring any of the Primary Documents mentioned in the article. Can I get # Philippine national ID? May I request to have the list of accredited offices to apply for National ID.I am a resident of Lanoa del norte MIndanao.Thank You Apprecaite. I only have PSA birth certificate and PSA Marriage Contract, and i have only school i.d. 19yrs old. Can i get national i.d? Yes. You can have your national ID using those ID and documents. I have Voter’s ID and Philhealth would that be ok? Yes that is ok. Basta may PSA Birth Certificate na kasama iyan. Can i apply if i only have birthcertificate and nbi? As a college student, I only got PSA birth certificate, a school ID and a Barangay ID. Now, am I qualified po ba to apply for National ID? I’m planning to go to PSA this week or days after Christmas. Thanks po! Yes, that is already suffice requirement. Paano po yung mga walang goverment ID ipwede po ba mag register un ng national ID? As long as my PSA birth certificate. Hindi namin need ng government-issued ID kundi government-isuued document na may full name, photo and signature or thumb mark. YES. Plus PSA-issued birth certificate. pwede po ba ang school ID and barangay ID? Basta may PSA-issued birth certificate ka and one (1) government-issued identification document with full name, photo and signature or thumb mark. I only have my PSA-issued birth certificate and NBI clearance .Would that be ok? YES. PSA-issued birth certificate and one (1) government-issued identification document with full name, photo and signature or thumb mark.